Many people are discouraged about the level of political discourse in the United States, in part because of the usual and tired "Right vs. Left" arguments that are unfolding in the Presidential campaign currently going on. The frustration about the lack of innovative thinking in politics is understandable, but in a recent Wall Street Journal editorial, Steven Johnson contends that there are reasons to be optimistic about American political culture, and cites SeeClickFix as evidence. He writes, "But seeing the world through these easy oppositions blinds us to the growing prominence of a group of new organizations: fluid, collaborative networks working outside both the marketplace and the state to improve the world in inventive ways. Inspired in many cases by the decentralization of the Internet, the movement uses the peer network as its organizing principle, with no single individual or group 'in charge.'" And continues, "Consider the maps released earlier this month by the New Haven, Conn., organization SeeClickFix. Zooming in on a city neighborhood, you will see clusters of color hovering over certain blocks. Those bands indicate urban problems that ordinary citizens have reported using the SeeClickFix app: gaping potholes, abandoned cars, graffiti. So far, city governments have used the data to address more than 125,000 cases in neighborhoods across the U.S."
It's very satisfying to be recognized in this way. SeeClickFix is intended to facilitate pragmatic solutions to everyday concerns, but also to be a disruptive force that changes the way government is conducted. These two objectives go hand in hand, and its important not to lose sight of either. In the editorial, Johnson is referencing our new geographies feature that was launched in a recent round new features, but we see more examples of this every day. For example, our hometown of New Haven is aggressively innovating in the way it delivers city services by leveraging SeeClickFix. WBTV in Charlotte, a SeeClickFix media partner, brought attention to a drain that had long been broken, which prompted the city to resolve the problem. As Steven Johnson notes, if you only read the headlines, you're probably going to be discouraged about politics in America. The local conversations that SeeClickFix is facilitating to enable citizens to improve their neighborhoods demonstrate that there is more to the story, and provide reasons to be optimistic after all. HENDERSONVILLE, NC — The City of Hendersonville has rolled out a new program that will make it simple for citizens to report non-emergency public space issues and have them resolved. SeeClickFix web tools and mobile applications are now integrated with the City’s internal Cityworks CRM system, allowing reports submitted by residents to be automatically routed to the appropriate department for review and resolution. SeeClickFix can be accessed by Hendersonville residents through the City’s website (cityofhendersonville.org) or by downloading the SeeClickFix app for iPhone or Android. Residents with Blackberry or Window’s Phone smartphones can report via SeeClickFix’s mobile website on their device browser. The program will prompt the user to report non-emergency issues using a description and specific location. Once an issue is reported, the user will receive updates about the status of the problem, and again when the problem is resolved. Reported issues and resolutions submitted by other users can also be seen. The user also has the capability to take a photo of the problem and submit it directly through the smartphone app and web tools. Bo Ferguson, Hendersonville City Manager, feels that it will be beneficial to empower all residents and visitors of Hendersonville to help find problems and get them resolved. "This technology opens the door for everyone to play a role in making our community better," said Ferguson. "We only have 210 employees, but we have 13,500 citizens and 26,000 water customers. By giving all those people a tool to find and report issues, we’re poised to do a much better job of identifying and responding to our citizens’ and customers’ needs." While the program is a great way for citizens to get their concerns addressed by the City, it’s also a push forward in modern communication. The idea surfaced several years ago as the City of Hendersonville explored opportunities to provide services using new technology. The integration of SeeClickFix and Cityworks in Hendersonville leverages this technology to benefit both residents and city staff. SeeClickFix has already been used to report several issues in Hendersonville ranging from drainage problems to missing street signs to garbage dumped on the side of the road. Photos have also been sent to clarify several of the reported issues. Check out this story on WLOS to see what's already being See Click Fixed in Hendersonville! Last week, the New Haven Independent highlighted the city's latest step towards going completely paperless - handling requests to care for New Haven's 52,000 trees using SeeClickFix! Until recently, the parks department relied on a paper-based system for monitoring and resolving tree-trimming and removal jobs. Now equipped with our new mapping and geo-filtering features, the parks department is the latest in the Elm City to benefit from the automatic, one-to-many communication the SeeClickFix platform offers to both governments and citizens. The Independent spoke with Rob Smuts, the city's Chief Administrative Officer, as well as Christy Haas, the New Haven parks department Deputy Director, about the switch to SeeClickFix for these types of requests. In addition to all current tree-trimming requests, completed requests dating back to March of 2011 have been input into our database for the city. The consolidation will allow New Haven to manage and report on all requests from one centralized and paperless point. As New Haven moves to implement SeeClickFix citywide, the parks department is the first to go live with the new protocol for managing reports. As our platform is expanded across departments, reports submitted via phone or in person will all be input directly into SeeClickFix. We're thrilled to see the City of New Haven saving paper, improving response time and promoting transparency using our platform! 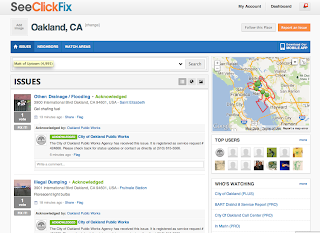 Interested in consolidating past and current reports into your SeeClickFix dashboard? Contact us to learn more about our professional services and take a step towards a paperless workflow in your city or town! Read the whole story on the New Haven Independent here! SeeClickFix CEO Ben Berkowitz selected as a "GovTech Innovator"
Ben Berkowitz is the CEO of SeeClickFix, a Web tool that saves local governments a lot of time. Taxpayers go online to write and send reports about non-emergency issues like potholes, graffiti or other incidents, which means they don’t need to call their local 311 lines for the same purpose. The application has national 311 potential, possibly sparing government operators from tearing their hair out due to large call volumes. SeeClickFix's Zack Beatty was recently in Chicago for Block by Block, a conference for Hyperlocal news enthusiasts and outlets. While there, Zack chatted with Amy Gahran, and a journalist for Knight Digital Media. Other than cool eye candy, this kind of widget can benefit hyperlocal sites and the communities they serve in several ways. First, SeeClickFix reports can be a story and source mine. Having the widget on your site makes it easy to stay aware of community-reported issues, help you spot specific incidents or topics to cover, or help you find sources or quotes to round out your coverage. The widget also can serve as a general community dashboard or scanner. And if your site sometimes focuses on certain themes, such as transit and alternative transportation, you may want to generate issue-specific widgets to complement your stories or sections. 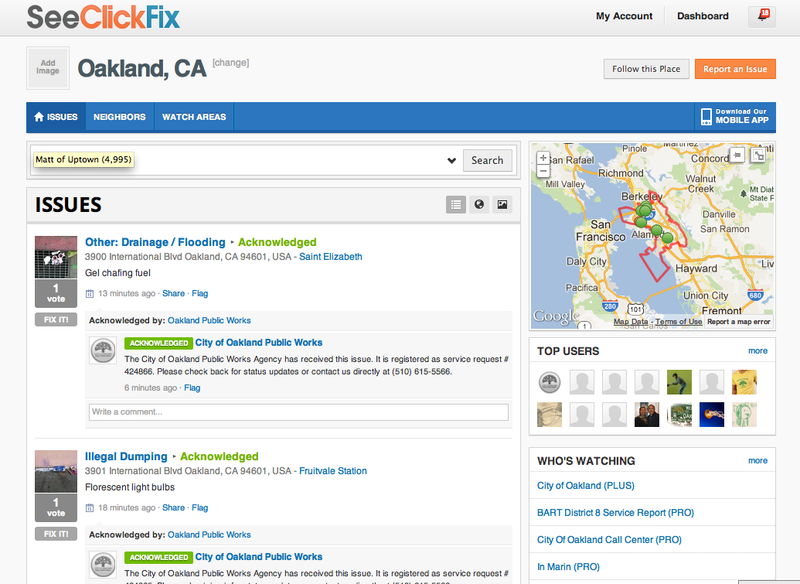 In some cases, SeeClickFix has become a way for citizens to help local governments solve problems. "That happens a lot with reports related to traffic and parking," Beatty said. "In one long-running thread I'm following, about reconfiguring a dangerous intersection, architects and other local experts have drawn up detailed plans and done significant research into possible solutions. The result is the equivalent of a year's worth of free consulting to the city." We hope that more hyper-local news organizations leverage SeeClickFix in their important work for their community! The intersection is not actually one junction, but two placed close together. Gilbert Road intersects with Lake Avenue at an odd angle, and approximately 100 feet away Lake Avenue intersects with Weibel Avenue at a light. In between those two intersections lie two business entrances — to a busy Stewart’s Shop and an office building. In response to the original SeeClickFix report, concerned citizens suggested a variety of solutions, from the installation of traffic lights, to the reduction of speed limits, to the construction of a roundabout. One SeeClickFixer recommended adding an on-ramp to I-87 (Adirondack Northway) from Lake Avenue, as a way to reduce the number of cars that pass through the. [DOT spokeswoman Carol] Breen said she would have the intersection added to the list of those being studied. A study, she said, would observe the traffic volume, how left turns are handled and the number of accidents. "They’ll see if there is anything that needs to be done". The study should be taken up shortly, according to Breen. Of particular note, this illustrates how SeeClickFix can be of particular aide in drawing attention to the dangerous intersections of roads of mixed jurisdiction. In the case, a Saratoga Springs city road (Gilbert Road) joins two state roads (Route 29 & Weibel Avenue), thus requiring involvement from the New York State Dept. of Transportation. The Saratogian uses a SeeClickFix media widget not only to engage their audience and improve their community, but also to generate unique hyper-local content and boost repeat website traffic. Our reporting and mapping tools connect their website with readers, and readers with their local government, for solving non-emergency public space issues. Citizens use the widget not only to post new concerns, but also to support the existing concerns of friends and neighbors by adding comments, adding photos or videos, and voting to fix. New Site Design launched over weekend. What do you think? We've been tirelessly working on a redesign of the website based on feedback from you our Government and Citizen users and Media Partners. Daniel Stainback, our fabulous designer and UX programmer was on the bulk of the work but it took the whole team to put the finishing touches on the release. We could go on and on about the various updates in the release, but if we did this right you'll come across them and let us know what you think. Our main goal in this design was to help you create issues and help make it easier for you to get more support for your existing reported issues.
" 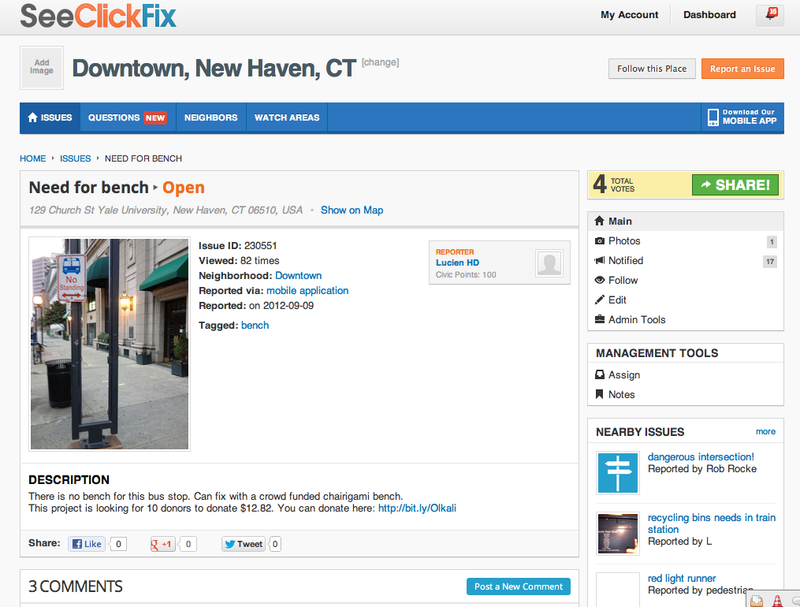 Thanks @lyften and @SeeClickFix team for the lovely redesign: http://bit.ly/TJqNO0 "
New Features for SeeClickFix Clients! Our engineers have been hard at work developing new features to enable our city partners to serve their citizens more effectively. Check out a few of our favorite recently released features below. Starting this week, SeeClickFix government clients will now be able to view issues reported in their area using our new mapping features! Client dashboards will soon be equipped with a new “Map” tab, allowing you to see what’s being reported on a large, easy to read map. The map tab will include search functionality that enables users to view issues by service request type, assignee and issue status. What’s more is we are giving SeeClickFix government clients the ability to filter issues on the map by smaller geographies within the boundaries of your city, town, or county such as council districts, neighborhoods, code enforcement areas, etc. The new map tab also includes the option to view a heat map of issues, making it easier than ever to identify trends and interpret the data your residents submit. Need to know how many open pothole issues are in a specific neighborhood or want to view all closed issues in one district of your city? Our new geo-filtering functionality allows clients to easily define smaller geographies within the boundaries of your city or town to sort, search, view and report on SeeClickFix activity in those areas. Here at SeeClickFix, we have heard from many clients who are creating tickets in our system for citizen requests submitted via phone call and/or walk-in visits. To help these users track the volume of issues submitted this way, the “Issue by Source” chart on our client's dashboard landing page now includes a new "City Initiated" category. Save time and keep residents up-to-date with information about their issues using our new Canned Messages feature! Available now in your SeeClickFix dashboard, Canned Messages allow you to create and save comments used for acknowledging and closing issues. When a user updates the status of an issue in the dashboard, they can select the message and the saved text will automatically populate the comment field. The SeeClickFix team got a bit of praise today from the New Haven Independent for its innovative response to a "personal" problem. We have a bus stop at our doorstep. That's awesome because we don't have to go far to take the bus. Its not awesome because it means that we can not exit out building many days without pushing people out of our exit. It creates tension and stress in a place where its least needed...at the entrance to work. We thought of many resolutions to the problem including requesting a bus shelter from the city, putting up signs on the door to ask folks to not block the exit, to actually moving the office entirely. As the first two solutions have yet to be effective and the third solution (running from the problem) is not in our DNA we opted for a fourth suggested by our good Alderman, the Honorable Doug Hausladen. Why not use SeeClickFix to crowd fund a seat for our friends at the bus stop he asked? Also, why not buy the seat from local retailer Chairigami ? 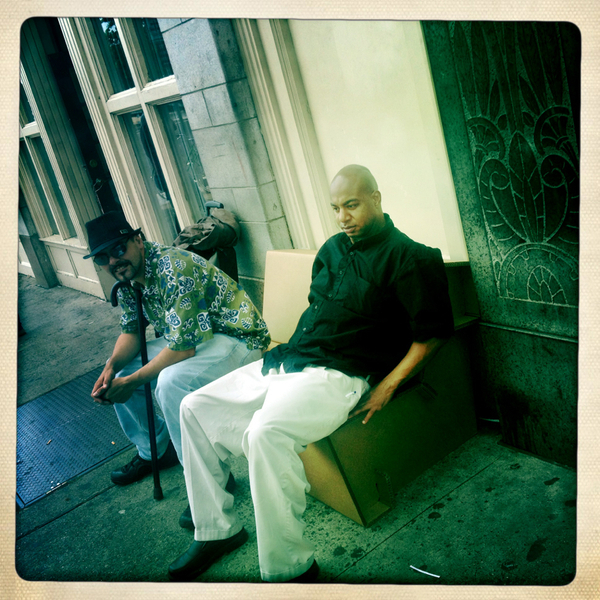 And so we ventured forth to purchase a cardboard bench for the bus stop. 5 SeeClickFix users donated to the bench almost immediately, validating a model of civic fund raising as well as creating an immediate solution to a real problem. We put the bench on the street the next day and left a marker on it with a note reading, "What are you waiting for?" Within four hours the bench was decorated with messages of encouragement, rest in peace scrawlings and the occasional "I love you dad." I have had the most enjoyable interactions with folks as I bring the bench in and out every evening The most recent one occurred a few hours ago with a girl who also just lost her father as documented by her scrawling on the bench. What once was a place of friction and tension for me and others coming and going from our office has become a place of positive social interaction. The bench is more than just a seat, its a platform for connecting and working together as neighbors to solve problems through kindness. The New Haven Independent covers the evolving narrative here. Macon, GA was rightfully praised for its responsiveness to citizen concerns in a recent story by local news station WMGT 41. "Macon resident, Josh Rogers, walks his dog on Ross Street every morning. Two weeks ago he noticed a broken street lamp, so he decided to try the "See-Click-Fix" app on his phone. He stopped, took a picture, pressed a button, and continued his walk. 'The next morning it was completely cleaned up, they put a cone where the street light was, and hopefully they'll bring it back repaired pretty soon,' says Rogers." "You don't really have an excuse, it's so fast and so simple, and you could enjoy it cause you're walking around the next day and it's fixed." Congratulations to Macon for this well deserved recognition, and keep up the great work!